Produktinformationen "Heavenly cooking with Ayurveda"
A great ayurvedic cookbook with detailed chapters on herbs and spices. Frank Lotz is one of the most famous and well known Expert in the Ayurvedic field (healthy living & Vedic cooking style) with high reputation all over Europe. Frank just released 2. of August 2012 this great Ayurveda cook-book with over 120 recipes. All recipes show you how to pacify the 3 Doshas and theyery tasty, light to digest & healthy too. In the beginning is a big chapter (Introduction) what is all about Ayurveda. Then follows the chapters on Herbs & Spices with deep knowledge how to suppliment it in our daily life for the most known western and indian herbs & spices. It contains stories from the Vedas & Puranas. 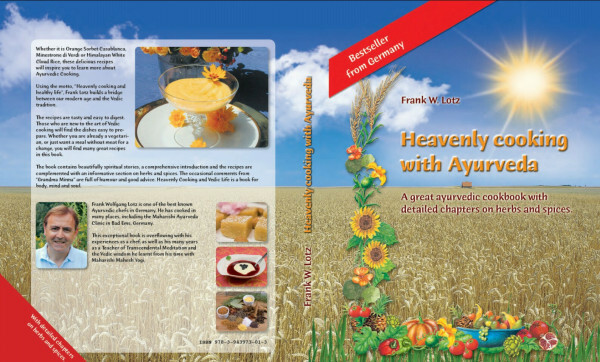 "Heavenly cooking with Ayurveda" is even an extention to the German Bestseller "Himmlisch kochen und Leben im Einklang mit dem Veda"
Frank Lotz studied many years in Maharishis place where he himself was present at that time. The pictures are "mouth watering"! 4 coloured thoughout the whole book! CO2 emissions of this product have been compensated with emission reduction certificates. Weiterführende Links zu "Heavenly cooking with Ayurveda"
Kundenbewertungen für "Heavenly cooking with Ayurveda"